Contact Us – Atlas Engineering Services Ltd. PLEASE NOTE THAT ACCESS TO STOCKLEY PARK IS VIA THE A408 ONLY. THERE IS NO ACCESS VIA THE A437. Follow exit signs from any of the 3 terminals. Continue straight over Emirates Roundabout onto M4 Spur. 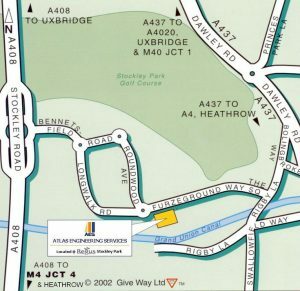 For Heathrow Terminals 4 & 5 follow M25 to M4 and continue with directions as above. Terminal 5 – Take 350 Bus from terminal 5 to Uxbridge or Piccadilly Line to Heathrow Central then Bus A10. Take Heathrow Connect Services from Paddington to Hayes & Harlington Station, then bus 350 to Stockley Park. Alternatively, take Piccadilly line from central London to Heathrow Central, then bus A10 to Stockley Park. Copyright © 2019 Atlas Engineering Services Ltd.